John Anthony Franco (born September 17, 1960 in Brooklyn, New York) is a former Major League Baseball left-handed relief pitcher. During a 21-year baseball career spanning 1984–2005, he pitched for three different National League teams, the Cincinnati Reds, New York Mets, and Houston Astros. His 1,119 career games pitched is an NL record, and is ranked fourth in major league history; his 424 career saves ranked second in major league history when he retired, and remains the most by a left-hander. For 14 of his 20 seasons, he played for the New York Mets, serving as team captain in his final years with the team. Franco grew up in the Bensonhurst section of Brooklyn. His father, the late Jim Franco, was a New York City Department of Sanitation worker who encouraged his son's baseball aspirations; Franco honored his father by wearing an orange Sanitation Department work-shirt under his jersey. John graduated from Lafayette High School in Brooklyn and St. John's University in Queens, where he pitched two no-hitters in his freshman year. John is married to his high school sweetheart, Rose, whom he has known since he was 17. They have three children: J.J., Nicole and Ella. .
His son J.J. Franco, who was drafted by the Mets out of high school, attended Brown University where he played as an infielder. J.J. was drafted by the Atlanta Braves in the 2014 MLB draft. John Franco at Citi Field in 2014. Franco was originally selected by the Los Angeles Dodgers on June 8, 1981 in the 5th round of the amateur draft. Before reaching the major leagues; however, he was traded to the Cincinnati Reds on May 9, 1983 with Brett Wise for Rafael Landestoy. Landestoy batted under .200 before retiring the following year while Franco was a star reliever for much of the next two decades. Franco debuted with the Reds on April 24, 1984. Franco was a traditional relief pitcher with a "90-mph fastball and a change-up that breaks away from a righthanded batter like a screwball." Throughout his six seasons with the Reds, Franco was a successful closer, winning the National League Rolaids Relief Man of the Year Award in 1988. He helped the Reds finish second four seasons in a row (1985–1988). On December 6, 1990, became team captain, and remained the closer until 1999, when he moved to a setup role for new closer Armando Benítez. He led the league in saves for the 1988, 1990, and 1994 seasons. He reached the postseason for the first time in 1999 and the World Series in 2000. On May 11, 1996, in a game against the Chicago Cubs, the Mets held "John Franco Day" to celebrate his 300th career save. In the fifth inning, a brawl that cleared both benches and bullpens resulted in Franco being ejected from the game, along with eight other players. An unusual occurrence considering it was his "day" and he was in the bullpen. Injuries caused Franco to miss the 2002 baseball season, but he made a successful recovery from surgery and returned in June 2003. He signed a one-year contract for the 2004 season. He finished with a 2-7 record with 36 strikeouts and a 5.28 ERA in 46 innings. In January 2005, he was signed to a one-year deal with the Astros, at the age of 44, making him at that time the oldest active pitcher in Major League Baseball. On July 1, 2005, Franco was designated for assignment, and he was subsequently released, which proved to be the end of his baseball career. He also most recently appeared on the television show Pros vs Joes. During a recent interview, he revealed that he never threw a screw ball, but instead only threw a circle changeup. On March 29, 2009, Franco threw the ceremonial first pitch in the first game played on Georgetown. 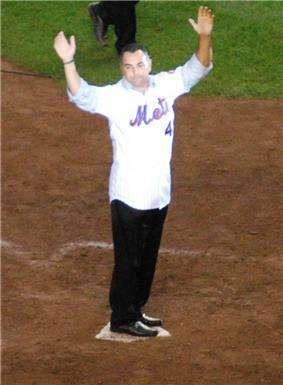 On June 3, 2012, in a ceremony at Citi Field, Franco was inducted into the New York Mets Hall of Fame. Saves: 424, 4th most in major league history behind, Mariano Rivera, Trevor Hoffman and Lee Smith and the most for any left-handed pitcher.